Now here is something that you might want to consider after getting your daily fix of PS3 as well as Xbox 360 (the Wii does not really count since the graphics are not exactly worth looking into) – the Atari Flashback 3, and as its name implies, it offers a blast from the past. Retailing for just £39.99 a pop, it will let the younger generation in your home enjoy what used to occupy your time back in the days when you were a wee lad. 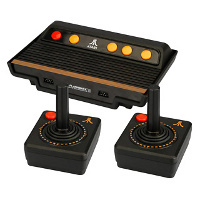 Yes sir, it even comes with its own set of old school joysticks to set the classic gaming mood in your home. Just plug them into the console, and you will enter a “time machine” of sorts, with everyone in the room enjoying what real gameplay is all about, without having to worry about how many pixels it is able to cram into the screen. Forget about Angry Birds or Call of Duty, this is something you might want to look into if you want to take a trip down memory lane. You totally missed the point, Why would we want to play those out of date graphics games? Replay value. Something that nearly every game on the Wii has, unlike the Xbox or Ps3 which focused totally on grapics, and left out the most valued parts of what makes a game fun.. Pong 4 player, Boxing, Kaboom. All very very poor graphics, But OMG what a blast! !